Become a Super-Villain in Gotham City! Can you escape the World's Greatest Detective? The Joker, Catwoman, The Riddler, and Poison Ivy are pulling off elaborate heists to score as much loot as they can carry! 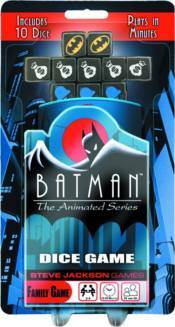 Based on the award-winning TV show, the Batman: The Animated Series Dice Game lets you become a Super-Villain in a press-your-luck game for the whole family. Roll the dice and take advantage of each villain's diabolical abilities to scheme your way to victory before getting busted by Batman!